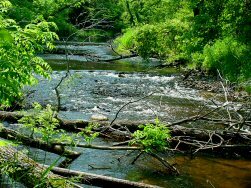 The Pere Marquette River located in portions of Lake, Mason, Newaygo and Oceana counties, the Pere Marquette River system drains an area of approximately 740 square miles. Roughly 53 percent of the watershed is in Lake County. The mainstream starts at the confluence of the Middle Branch and Little South Branch, known as the "Forks" and flows in a westerly direction for approximately 67 miles to its mouth at Pere Marquette Lake, just south of the City of Ludington. A classic trout stream, this beautiful sandy river wanders gently through overhanging bluffs, rolling hills, and across the grassy floodplains of central Michigan on its way to Lake Michigan. One of the finest trout streams of the Midwest, the Pere Marquette is open to many different types of fishing. Designated Reach: November 10, 1978. The segment downstream from the junction of the Middle and Little South Branches to its junction with U.S. Highway 31. Classification/Mileage: Scenic -- 66.0 miles; Total -- 66.0 miles.